Flying Goat Chef Darrin Gleason. Darrin Gleason knows the food industry. He's worked at virtually every level of the business in his long career — from food expeditor to banquet chef to pastry prep to executive chef. One thing has been consistent through it all. "My philosophy," says Gleason, who has been in the restaurant industry and cooking since 1994, "is to know your basics." Twenty years ago, Gleason started out at Tomato Street in Spokane, a job followed by a short stint as banquet chef at the University Inn in Moscow. After graduating from Spokane Community College's culinary program, Gleason worked as a sous-chef and pastry chef at the former Combray in Pullman, eventually landing a long-term gig at Klink's Williams Lake Resort in Cheney. At Klink's, Gleason settled down and spent 10 years learning all the ins and outs of running a restaurant: hiring, training and supervising staff, as well as quality control, purchasing, menu planning, and of course food prep. 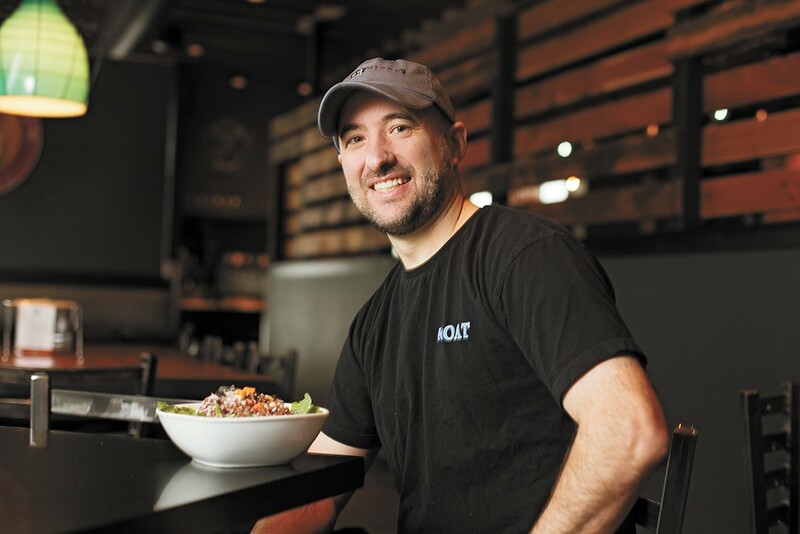 In 2003, Gleason caught the eye of respected chef Jonathan Sweatt, who opened the Downriver Grill with family members in 2003. Gleason became their executive chef. When Sweatt and John Stejer created the Flying Goat in 2010, they brought Gleason along. Seasonal ingredients and food trends help direct some of the menu choices at the Goat, says Gleason. For this issue, he shares a salad recipe pairing quinoa with spinach, root vegetables and maple syrup vinaigrette. 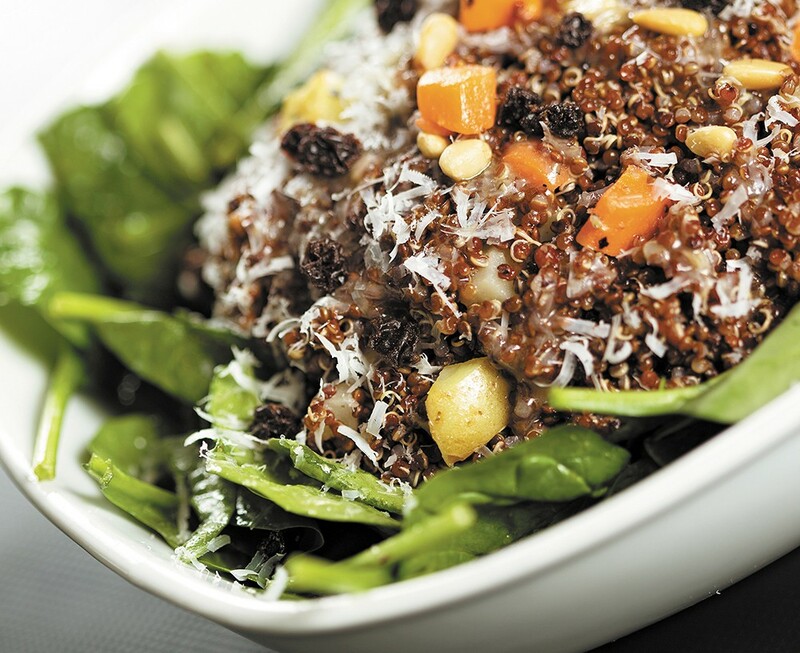 The spinach quinoa salad provides a complete protein, notes Gleason, making it ideal for those following vegetarian and vegan diets. The dressing is also gluten-free, like all the Goat's salad dressings. And it's adaptable — in the warmer months, he recommends substituting blueberries for the root vegetables, and going with a white balsamic vinaigrette. Like their salads, the Flying Goat's pizzas vary throughout the seasons, featuring a new special every Thursday. Some offer twists on classic flavor combinations, like the Lacrosse, with olive oil, mozzarella, Italian sausage, red pepper preserves, fresh basil and shaved Parmesan. The D Street is a spin on Thai pizza, with yellow coconut curry, chicken, potato, carrot, jalapeño, cilantro, lime juice, Sriracha sauce and cheese. Other menu options are a definite departure, such as the weekly pizza specials that might feature any number of unusual ingredients: calamari, étouffée, chorizo, blood oranges, veal pistachio meatballs. For Gleason, it's just another day doing what he loves: being the go-to guy in the kitchen. When he's not in the kitchen, the 43-year-old father of two young boys likes to hunt, fish, and do carpentry and landscaping. He likes being the go-to guy, says Gleason, both at home and at work. 1. In a three-quart saucepan, sauté shallots, carrots and parsnips until tender. 2. Add garlic and sauté until fragrant. 3. Add quinoa and stock. Bring to a boil then reduce to a simmer. Season with salt to taste and cook for 15 minutes or until liquid is absorbed. 4. Remove from heat and chill. 1. Combine vinegar, syrup, mustard, Worcestershire, salt and pepper in food processor. 2. With processor running, drizzle in olive oil to emulsify. 1. Toss spinach, pine nuts, and dried fruit. Dress with vinaigrette to taste. 2. Top spinach with chilled quinoa. 3. Drizzle a little more vinaigrette over the quinoa and garnish with cheese to your liking.